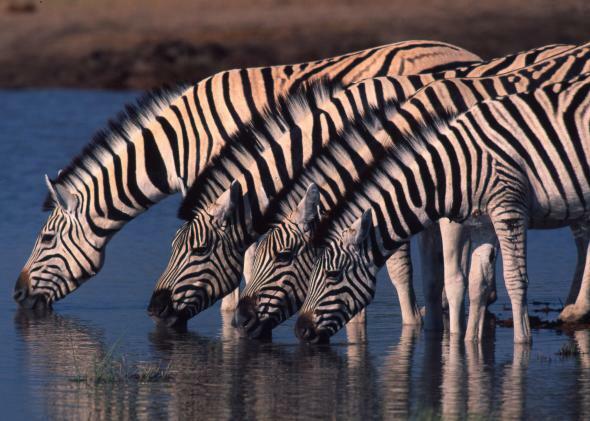 Longest wildlife migration: Africa’s zebras travel from Namibia to Botswana. Wildebeests in the Serengeti were thought to hold the record, but zebras migrate farther. Scientists have just discovered Africa’s longest terrestrial wildlife migration—and it’s not in the Serengeti. It’s the annual movement of thousands of zebra traveling 500 kilometers (more than 300 miles) round-trip between Namibia and Botswana. Using GPS collars on eight adult zebra, Robin Naidoo and other scientists from the World Wildlife Fund and Namibia’s Ministry of Environment and Tourism, in collaboration with Elephants Without Borders and Botswana’s Department of Wildlife and National Parks, have documented the annual sojourn of these striped sprinters back and forth between the floodplains of the Chobe River in Namibia and the grasslands of Botswana’s Nxai Pan National Park. It’s hard to believe that with all our knowledge and technology we are just now discovering the continent’s longest land-based wildlife journey—the distance is the equivalent of walking from San Diego to San Francisco. The zebra migration is even more unbelievable when you consider that Africa’s wildlife, like most around the world, has lost its freedom to roam over the years. From guarded borders between nations, to fences separating wildlife from livestock, to habitat loss and the escalating crime of poaching, wildlife and its migrations have taken a huge hit. Many of these migrations have been blocked before we knew of their wonder. If parks and natural areas are the life-sustaining organs of Earth’s inhabitants, migratory routes are the arteries that nourish them, and the migrations themselves are the pulse of our living planet. Yet that pulse may be weakening, whether it’s the migration of monarchs from the United States and Canada to a small patch of highland forest in Mexico, the annual sojourn of gray and humpback whales along the Pacific Coast from the Arctic to the Gulf of California, or pronghorn antelope galloping from Canada to Montana’s great grasslands. But those zebras give us renewed hope. They start their journey in Namibia, a nation where wildlife protection was written into the constitution, and where people have come together to conserve nearly half the country. Many communities have organized conservancies to manage their wildlife collectively. They are reaping the benefits of the growing number of tourists who realize that Namibia is high on the bucket list of adventure travel. It’s the only region in Africa where lions are on the increase, rhinos are protected rather than poached, and where the largest population of cheetahs roams. 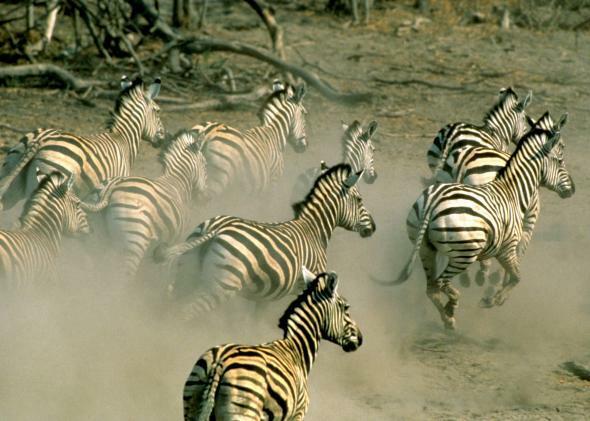 As the zebra migration shows, animals don’t recognize national borders. That’s why Namibia and four other countries—Angola, Zambia, Zimbabwe, and Botswana—allow wildlife to migrate across their boundaries, to allow nature to pulse through the incredible basins of the Kavango and Zambezi Rivers. In 2011, the governments signed a treaty to create the Kavango-Zambezi Conservation Area, the world’s largest conservation region, the size of Sweden. The treaty commits to transnational wildlife management and cooperation that lets animals such as elephants and zebras move freely across their borders. All five nations will benefit from a region whose animals and tourism opportunities surpass those of the far more famous Serengeti. The intrepid herd of zebras that journeys without passport annually across the Namibia-Botswana border has apparently been doing so under our noses for some time. Africa’s longest land migration is thriving and finally revealed.